The employee handbook is an important tool for veterinary employers. Yet many veterinary employers still do not have one, and those that do often have one that is outdated or inadequate. Does your practice suffer from any of the following problems concerning employee handbooks? If so, then it may be time to rethink your current approach. The first employee handbook mistake is not having one. Maintaining an employee handbook signals to your employees that you are aware of and compliant with the myriad employment laws affecting your practice. As such, this document is a ready reference for the practice’s human resources personnel, as well as for employees seeking guidance on your employment policies. Whether the employee is inquiring about medical leave, meal periods, social media policy, or overtime pay, the employee handbook will be the logical starting point. And if it adequately addresses the employee’s question, then this may minimize or even eliminate the need for time-consuming management involvement. The employee handbook should be sufficiently comprehensive to address the foreseeable circumstances that may require discipline or discharge. Such circumstances might range from using one’s smartphone excessively during working hours, to engaging in offensive conduct, to posting inappropriate things about your practice on the internet. Often, an employee fired for misconduct will nonetheless seek to collect unemployment insurance benefits. When this occurs, you might discover to your chagrin that it can be difficult to challenge the employee’s claim unless you can show that the misconduct violated a written policy. A comprehensive employee handbook can help. It’s tempting to hold back final wages when an employee leaves on bad term or simply leaves you in the lurch. This temptation can manifest itself in a policy in which employees forfeit their final paycheck if they fail to give, say, two weeks’ notice of a job change. Such policies can be extremely dangerous to the practice, as many laws crack down hard on employers for failure to pay earned wages. For instance, in Massachusetts, unpaid workers can recover triple damages plus their attorney fees and court costs from a practice that has taken this approach. Ouch. The bottom line: It is typically best to pay earned wages as they become due, without exception. In those rare instances where the departing employee is believed to have wrongfully harmed the practice, the safer approach is to pursue a remedy against him or her separately. Did you know that federal law requires employers to provide nonexempt employees who are nursing mothers with a clean, private location other than a bathroom that may be used to express breast milk? This location must be shielded from view and free from intrusion from coworkers and the public. Under this law, such employees may take reasonable breaks, as needed, for the purpose of expressing breast milk for up to one year following the birth of the child. Practices with fewer than 50 employees are not subject to this law if compliance would cause “undue hardship.” This, however, is a high bar to clear. Some states impose even greater protections for nursing moms. In Maine, for example, practices must provide these accommodations to all nursing-mom employees (both exempt and nonexempt), and they must do so for up to three years following the birth of the child. In light of the predominantly female workforce in the veterinary profession, every employee handbook should address this issue. Does yours? Some practices specify that if a leave of absence exceeds a stated maximum, then this will be cause for termination. Under this approach, if the employee cannot return to work following a Family and Medical Leave Act leave or another applicable leave, then the employee will be given the proverbial pink slip. This can get the practice into legal hot water. Under the Americans with Disabilities Act and cognate state laws, a leave of absence—or an extended leave—may be required as a “reasonable accommodation” for a sick or injured employee who needs more time to return to work. In some jurisdictions, courts have held that leaves for up to a year are “reasonable” for purposes of these laws. Thus, when an employee who exhausts your medical leave benefits asks for yet more time off, don’t jump the gun. Instead, engage in a meaningful dialogue about the situation, and then confer with your employment counsel about whether more time off may be required by law. Veterinary employers have many reasons for considering electronic surveillance of their employees. Placing video cameras in the workplace may help prevent the theft of pet supplies or drugs. Monitoring telephone calls made to and from the practice may help provide valuable training to the reception staff. And monitoring employee emails can help ensure that electronic business communications are appropriate in tone and substance. However, depending on where your practice is located, such monitoring may require advance notice or even prior consent. The employee handbook provides a perfect vehicle for this, as employers typically provide it at the outset of the employment relationship and require new hires to return a signed acknowledgement page. Done! When you started your practice, smartphones may not have been invented yet. Now, social media is everywhere, with tremendous implications for your reputation and your business. As an employer, the use of social media by your veterinarians, technicians, and other staff members is all but unavoidable. But do you have a written employment policy addressing this? A solid social media policy should prohibit posting information that would violate your other lawful policies (such as policies against harassment, discrimination, bullying, and disclosing confidential business information) while providing leeway to discuss the issues of the day, including various aspects of the employee’s work. The employee handbook is a great way to inform employees of the dos and don’ts before they start chatting away. And if you discover some troublesome posts, then the policy will give you a tangible framework for addressing the matter appropriately. 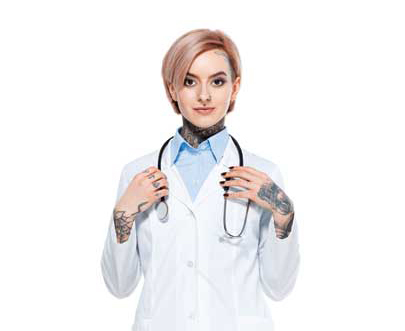 Tattoos and other forms of body art also have probably become more ubiquitous since you started your practice. Not too long ago, having a visible tattoo was the exception to the rule. But for many young people today, being splashed with ink is the rule. If this phenomenon bears on the professional image that you would like to project for your practice, then you should consider addressing this in your employee handbook. At a minimum, you might want to prohibit any such art containing obscene or objectionable messages. While we live in a wonderful world, it also can be dangerous and unpredictable. An employee handbook is a good place to set forth your expectations concerning workplace safety. For instance, if you wish to prohibit the possession of firearms in the workplace or on the practice’s premises, then this should be made clear in writing from the start of the employment relationship. Of course, any such policy also must comply with applicable state law mandates. It is critical for your actual practices to be consistent with your written policies. When written policies are not updated regularly, a divergence between practices and policies can arise. The danger in this scenario is that your business may no longer be handling employment matters uniformly, which can be a predicate for claims of discrimination and unfair treatment. Keeping your written policies current—and adhering to them—is the best way to go. Todd A. Newman, a Cornell Law School alum, works closely with veterinary practices. He is president and owner of a Salisbury, Mass., law firm (toddnewmanlaw.com) that focuses on business, employment, labor, and litigation matters.